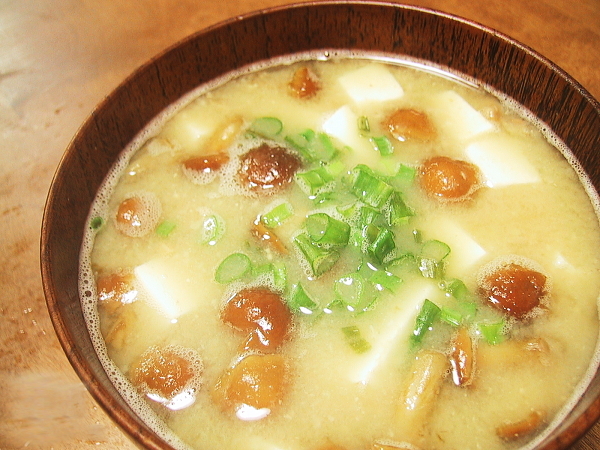 Natto is a great condiment to add to your miso soup! It is not only healthy, but also so comforting! Here is the basic recipe, which is open to so many variations. I did not bother with quantities as it is the basic recipe! I made it vegan to please everyone! (Vegan) Natto Miso Soup/Natto Jiru! First of all, you need dashi/Japanese soupstock. Check the Vegan Dashi Recipe! It will make for at least 60% of the whole soup. Heat the dashi but do not bring it to boil! Next you need miso paste. I personally prefer white miso in this case, but it’s open to all varieties. Bear in mind that usually the darker, the more salt miso will contain. Mix the amount of your preference (experiment) and and mix. The Japanese first put the miso in a large ladle and will mix it with a small amount iof the same dashi to attain a smooth mixture. Add a few small pieces of tofu! The amount is up to your liking! But first stir it well until it has attained a sticky paste state. Add to the dashi and cook gently, stirring from time to time if necessary until the natto has “spread” into the soup, losing its stickiness at the same time. My favourite are nameko, a small mushroom with a lot of “stickiness”. (Wikipedia: Nameko (Pholiota nameko) is a small, amber-brown mushroom with a slightly gelatinous coating ). You can buy them at Asian markets in sealed packs. Naturally you can always experiment with other mushrooms! No need to overcook, and please do not bring it to boil. Serve with a good amount of finely chopped leeks!